Following the Naxos Ring as it has emerged piecemeal since 2015 has turned into a disappointing experience. The recordings of Das Rheingold and Die Walküre suggested the cycle might become a real bargain-price alternative to the half-century of classic accounts already available. But there was uneven casting in the Siegfried, released a year ago, and that lack of consistency and coherence seems even more pronounced in this final instalment, recorded, like the others, in concert in Hong Kong 10 months earlier. Some elements have remained at a high standard throughout – namely the quality of the playing of the Hong Kong Philharmonic, in particular the authority of Jaap van Zweden’s conducting. His control of the huge musical and dramatic paragraphs of Götterdämmerung is always confident, and the orchestral set pieces – the Rhine Journey and Siegfried’s Funeral March – have an undeniably impressive dramatic presence. But vocally the performances are much less remarkable, with no continuity among the major roles from the previous operas. So here we have the cycle’s third different Brünnhilde (Gun-Brit Barkmin, this time) and its second Siegfried (Daniel Brenna); the only singer who has featured before is Michelle DeYoung, who was Fricka in Rheingold and Walküre, and is Waltraute here. Such inconsistency may not have mattered in the live concert performances spaced a year apart but is less than ideal when heard on disc as part of a unified cycle. As it turns out, the casting is never inadequate, just unremarkable. Both Barkmin and Brenna would probably pass muster in one-off performances on stage, but neither measures up to the existing competition on disc, and it’s only Eric Halfvarson’s implacably dark Hagen that conveys that sense of enduring authority. For all its good moments and some fascinating individual contributions, this does not add up to a Ring that matches the competition. is a visionary not only because he sets challenging goals for the Hong Kong Philharmonic to spur them on to heights they never thought they were capable of, but also because he does so with keen insight into the limitations the environment places on what is possible. His project to mount concert performances of Wagner’s Ring Cycle over four years has concluded with the final instalment – Götterdämmerung. To use a cliché, it was his crowning glory and, by most measures, a phenomenal success. After four seasons, the much-acclaimed concert Ring cycle of the Hong Kong Philharmonic Orchestra came to a triumphant conclusion with two performances of Götterdämmerung at the Cultural Centre Concert Hall. It is nothing short of a wonder that music director Jaap van Zweden has, within a few years, transformed the Philharmonic into a Wagnerian orchestra to be reckoned with, whose lush sound and technical finesse, not to mention the musicians’ fierce sense of dedication, were again very much in evidence in this second performance on January 21, even though the overall playing, though still very impressive, did not quite reach the exalted level attained in last year’s Siegfried. While van Zweden may not be the most individual interpreter of this music, his pacing was unerringly right, with orchestral balances perfectly calibrated and the architecture of the music firmly within his command. It was a magisterial rendition that faithfully revealed Wagner’s score in all its glory. Consistency in casting was not a top priority for this project, so that over the years we have been treated to three different singers for the role of Brünnhilde and two for Siegfried. Nevertheless, the overall standard of singing has been high, and there were some interesting casting choices along the way, with Matthias Goerne’s Wotan/Wanderer immediately coming to mind. Götterdämmerung featured a mostly new team of singers. In a notable role debut, Gun-Brit Barkmin gave an intelligent and deeply committed performance of Brünnhilde, conquering the role’s formidable difficulties with her athletic and resilient soprano, and she capped it all with a blazing Immolation. Although her interpretation would surely deepen with time and experience, it was in all respects a splendid assumption by a singer whose voice is in full bloom. Singing with uncommon lyricism, Daniel Brenna offered a dramatically incisive reading of the part of Siegfried, making clever use of the text to shape his vocal lines. While this may not be a very heroic conception in the traditional vein, it was undoubtedly a sympathetic one from a musical point of view, which underscored the tragedy that befell a fearless but naïve man when he was confronted with a world full of subterfuge. Eric Halfvarson’s darkly intense Hagen was thrillingly enacted, and despite his having apparently caught a cold, he did not spare his voice. 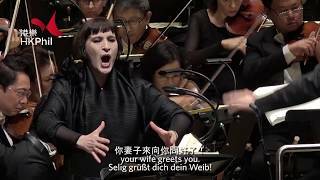 Shenyang presented an unusually aristocratic Gunther with his mellifluous bass-baritone, and although the part of Gutrune does not provide a lot of vocal opportunities for the soprano, Amanda Majeski’s silver-toned Gutrune sounded more than respectable in this assignment. Michelle DeYoung (the Fricka in the earlier operas) made much of the mini-drama in Waltraute’s narration with her plush mezzo whereas Peter Kálmán delivered Alberich’s urgings with quiet eagerness. With her clarion voice and noble delivery, Stephanie Houtzeel’s Second Norn stood out in a solid trio that also included Sarah Castle and Jenufa Gleich, even if they were at times hard-pressed by the orchestra at full throttle. Making a welcome return after the 2015 Rheingold, Eri Nakamura, Aurhelia Varak and Hermine Haselböck were the sublime Rhinemaidens, whose voices blended most beautifully. Coached by Eberhard Friedrich, chorus master of the Bayreuth Festival, the combined forces of the Hong Kong Philharmonic Chorus, the Bamberg Symphony Chorus and the State Choir Latvija made a mighty sound and sang with dramatic conviction. Their contribution in Act 2 was definitely one of the musical highlights of the evening. At the end of the day – which we have now reached for this live Hong Kong concert Ring cycle assembled over four years – this project’s main achievement may well prove to be the maturing of orchestra, conductor and recording team in performing Wagner’s music. Each instalment has represented a measurable advance on the last – and the orchestral brass, in particular, may feel proud of their work here. There have been objections to Naxos’s varying cast (though we have had a single Wotan, Mime and Erda) but this is not a stage cycle and these changes have helped keep the project in touch with today’s upcoming voices. Of this recording’s ‘newcomers’, Gun Brit Barkmin (her debut in the role) brings imagination and flair. It’s quite a ‘white’ voice and not a huge one but she’s a committed projector of the drama. This cannot (quite) compensate in the sections of the score that are, at least for now, just too weighty for her, especially, in Act 2, the oath on the spear and the later outburst of grief which provokes Hagen’s offer of revenge. Daniel Brenna’s voice, again not heavy but well focused, certainly records comfortably and he is always fully in touch with the dramatic requirements. Eric Halfvarson’s Hagen, more experienced than this pair, is both vicious and frightening (as opposed to just plain ‘black’) of voice but occasionally sounds not in 100 per cent of health. Shenyang’s impeccably voiced Gunther sounds like he has just emerged from language school, so carefully received is his pronunciation. Amanda Majeski’s Gutrune is similarly noble without much dramatic impact; Michelle DeYoung is a reliable if rather neutral Waltraute, not helped by van Zweden’s uncertain pacing of the scene. Norns and Rhinedaughters contribute well. Van Zweden keeps everything moving at a good clip but seems to respond more emotionally to certain scenes than to others. After a rather uncertain Norns’ scene the Dawn Duet and Rhine Journey go with terrific panache, an impact later rediscovered in the big ensemble scene of Act 2 after Brünnhilde is brought back from the rock. He is (unsurprisingly) not yet so sure of what all the music means, or relates to, and those little instrumental decorations which Barenboim, for example, colours and places so precisely (hear the 2013 Proms performances, if you can) tend rather to go for nothing. Also, more surprisingly for a noted Brucknerian, energy tends to drain away from slow-moving passages, which makes some of the final Immolation hang fire. There are now so many Rings available at discounted prices that, in both marketing and artistic terms, it’s no longer possible simply to give this newcomer of very real merits a special bargain option box in some collectors’ batting order of desirability. The best of this latest instalment and its predecessors has that unique excitement that comes from a major task attempted for the first time. There’s little dull here, it always sounds good and it could make for an ideal economic first-time listen to the work. A selection of important rivals: Clemens Krauss (Pristine), Wilhelm Furtwängler (Pristine twice), Joseph Keilberth (Testament) and Daniel Barenboim (various).